Simply due to the tragic fire that's engulfed Notre Dame today (thankfully it seems the two towers will be saved, and most of the artwork! 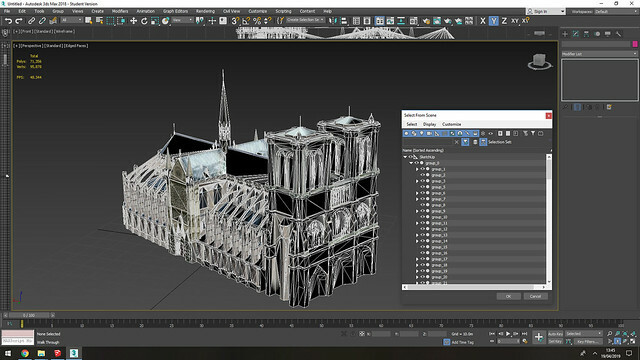 ), being able to build Notre Dame in Banished would be grand. We won't rebuild it tomorrow, but perhaps we can rebuild it in Banished until it's rebuilt in Paris! A truly tragic event in Paris today. Thank God the historical cathedral is not a total loss and there were no injuries or loss of life. Would love to see this in game! yeah sketchup 2017 or 2018. my 3dsmax can convert only 2016 because it is old a bit, a 2016 version. This is a great idea! Imagine what the cost of construction for Bannies would be, lots of stone, wood and build time! I'm running 3DS Max 2018 and I've just tried importing both the 2017 & 2018 Sketchup formats but it can't process either. Maybe Blender can open it for conversion? Not sure as I have limited experience of Blender and Sketchup. But this are huge work for modder. Should be possible to import in 3DMax. Thanks Kid, following your advice I got the model into Max. The polycount is huge and it is constructed from many smaller meshes grouped as children under a dummy, each with its own texture file. It will need a lot of refinement to make it in game. Even if you have to make it little "poor looking" I'm sure it would look like wonder in the game. i know thats a lot of work... i would personally would try to see if it can be better to redo it without all the details that eat hugely the amount of polygons. i did that with abandonned church model i found. i didnt touched the mighty cathedral tough, i let it as i got it. building process meshes can be very hard too. PS. : you can also use the option Pro Optimizer for each part of the cathedral with different % numbers and try to get max without clear changes depending each part what it can give you .... make sure you always check the "Keep Textures" checkbox.